The UA College of Medicine – Phoenix seeks physicians, scientists, health professional candidates and especially alumni looking for a way to get involved with our students and the college. The college inspires and trains exemplary physicians, scientists and leaders to optimize health and health care in Arizona and beyond. We are uniquely positioned to accelerate the biomedical and economic engines in Phoenix and the State by leveraging our vital relationships with key clinical and community partners. Clinician recently relocated to the greater Phoenix area. Physician currently practicing in the area. Play a critical role in the selection of students who will be chosen for admission to the University of Arizona College of Medicine – Phoenix. Applicants must complete an interview to determine the “softer skills” of a physician-in-training: communication, empathy, ability to work within a team, etc. To make a strong assessment of the student’s abilities, the college uses an interview format called the Multiple Mini-Interview (MMI). As the name suggests, the MMI involves multiple people to view the student in multiple situations. Interested in teaching medical students in your office or hospital setting, but don’t have the time to commit to a month-long elective? The capstones course may be the perfect fit for you! First- and second-year medical students observe clinicians and health care teams in every specialty and subspecialty; in clinical, laboratory science and research settings; for a half-day per site. They visit several different clinical sites in each capstones week to gain clinical context for the basic sciences they recently learned. Faculty title encouraged, but not required. Attend a CBI facilitator development training. Shadow a full CBI with a current facilitator. Begin independent facilitation and case assignment. The Clinical Anatomy Block takes place from August to December in the gross anatomy laboratory. 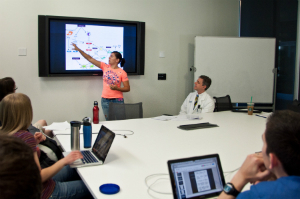 Labs take place from 9 a.m. to noon on Tuesdays and Thursdays, with six, first-year medical students and one instructor assigned to each table. Instructors assist students in identifying structures on the donors and oversee their dissections. In addition, students are encouraged to develop critical-thinking skills, applying their knowledge of anatomy to clinical cases. The clinical anatomy block offers a unique opportunity for physicians to work with first-year medical students as they explore the structure of the human body. Faculty title required. Clinical Application Sessions (CAS) are clinical, case-based scenarios that develop and hone critical thinking skills, encourage discovery and reveal gaps in student knowledge. CAS facilitators have a unique opportunity to interact with Pathway students in a small-group learning environment. Facilitators provide students with insight and perspectives specific to experienced clinicians or basic scientists. Faculty title recommended. We are in need of physician preceptors for our medical students volunteering at our student-run free clinic for patients experiencing homelessness. Shifts are monthly on Saturdays, 9:00 a.m. – 1:00 p.m., on the Human Services Campus (cross-streets 12th Ave/ Jefferson) in Phoenix. 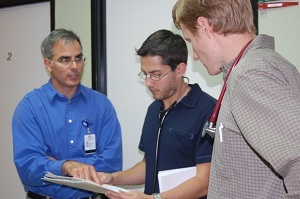 Medical students see patients as part of an interprofessional team of students and faculty from ASU, NAU and UA. Interprofessional health care providers are also needed to precept students in respective disciplines. 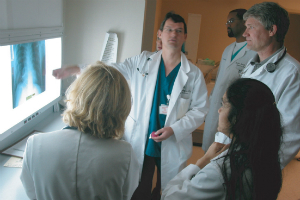 The curriculum at the UA College of Medicine – Phoenix places a high priority on early and continuous clinical training. 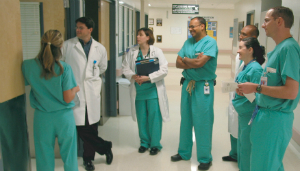 All first- and second-year medical students spend one halfday, approximately every other week, in an ambulatory setting working with a physician preceptor. This part of their education is called the Community Clinical Experience (CCE). As the class grows, the demand increases for experienced physicians to mentor students as preceptors within the CCE program. The CCE program is invaluable, allowing the student to gradually assume an increasing level of patient care responsibility at local practices. Faculty title required. The electives program gives students a wide-variety of clinical and non-clinical experiences to augment their medical education. Variety is key for students in their fourth year. We are excited to continue expanding our elective opportunities for our growing student body and welcome new and enthusiastic faculty who will contribute to the depth and variety of the educational experience of our students. Faculty title required. Are you a primary care physician? Do you want to share your clinical expertise with students as they learn directly from patients about the experience of having a chronic medical condition or disability? Become a grader for the Longitudinal Patient Care Course, also known as the Community Health Mentor Program! In this course, third- and fourth-year medical students work in interprofessional teams with students from the dietetics, nursing, occupational therapy, physical therapy and physician assistant programs. They visit with a patient who serves as a mentor and then provide a written reflection on what they learned. We are seeking physicians to provide feedback on these reflections and share their clinical expertise with the new generation of health care professionals! Grading only occurs seven times per year (about every six weeks) and is easily completed online. Faculty title required. We are seeking physician colleagues who enjoy reading, writing and self-reflection to serve as Reflective Writing Reviewers for our MS1-4 medical students (Capstones and Intersessions courses). We are looking for Reflective Writing reviewers who can respond thoughtfully, share experiences and promote humanism in medicine, resilience and professional identity formation. Optional opportunities to attend reflective discussion small group events on campus will be available. Scholarly Project (SP) is a four-year mentored research project carried out by every student. The SP prepares students for life-long learning and critical thinking, as students develop advanced inquiry and problem-solving skills to support clinical practice and future projects they may undertake in their careers. The mentor works with the student over four years, helping the student formulate the prospectus; plan and implement research; and analyze, interpret and present results. Each student produces a poster and a written thesis in their fourth year and presents the work at the spring Student Research Symposium. Faculty title recommended. Our Simulation Based Training (SBT) program spans across all fours years of the medical student curriculum and provides participants with a safe environment for both the learners and patients. With simulation, scenarios and events are customizable to the learning objectives and individual student needs. Simulation instructors and facilitators have the unique opportunity to work with our students as they practice procedures and work on knowledge translation in a safe and simulated environment. 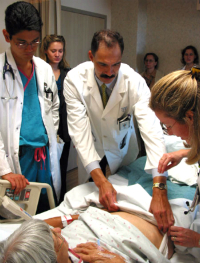 As part of one of the most advanced simulation curriculums in the country, you will teach at the bedside and participate in our self-reflective debriefing sessions, where our students enjoy the benefits of experiential learning. We would love to have additional energetic, engaging and brilliant physician educators. The Mission of the Wellness Program at the University of Arizona College of Medicine – Phoenix is to contribute to the well-being and development of all students by offering an opportunity to participate in small cohesive groups or cohorts at the beginning of their medical school career and continue ongoing as a network of support and informal mentorship. A Wellness Mentor is a physician in the community, who can volunteer some time to mentor and participate in activities (on and off campus) with their assigned group of eight MS1s and four MS2s (Big sibs/peer mentors). The hope is that the wellness mentor will continue their relationship with this group throughout the four years of medical school. Supervision of UA College of Medicine – Phoenix medical students requires faculty status with the college. Faculty title includes university-related discounts, access to research publications, and building strong relationships with young physicians-in-training at the college. Apply for Faculty Title. All faculty who teach medical students have access to retreats, development workshops, meetings, grand rounds and online materials. We offer programs on the development of innovative curricular sessions and opportunities to develop effective assessment, evaluation and feedback skills. Faculty development offers assistance with academic resources and how to utilize them. Faculty have unrestricted access to the digital resources from the AHSL Library by use of a UA NetID and password from your office, hospital or home. Access more than 600 electronic books, 6,000 electronic journals, and major resources such as, PubMed, Web of Science, Up to Date and the Cochrane Library. Available services include connection from off-campus, library guides, tutorials, DocOrder/Interlibrary Loan and specialized resources that support the phoenix curriculum.